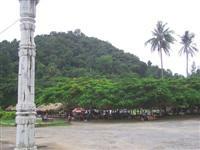 From Phnom Penh, a great excursion is the formerly lavish resort town of Krong Kep. Once a famous high-society destination, called The Pearl of the Orient, Kep is now more of a rustic fishing village; a peaceful and charming destination for those who like to travel off the beaten track. The Khmer Rouge did a number on this town, but the ruined villas of the rich now add to Kep's crumbling mystique. A beautiful coastal road, slivers of beaches, jungled mountains, and the nearby Rabbit Island ensures that Krong Kep continues to draw visitors to its shores.